Google has been like the lifeline of the internet since its existence. Most of the time, internet searches are conveniently named Google searches which implies that the company, is so embedded in the common man's life. The Google Story is the story of how a company formed by two young adults, has completely changed the world of technology and how the world operates. Google has been the most successful innovation in the field of information technology, and more than sixty million people use Google services regularly. 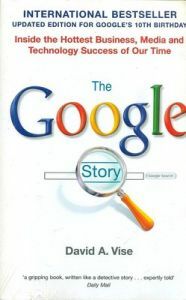 In order to celebrate the 10th birthday of this remarkable company, this book, The Google Story, narrates its growth and development, which has faced tough challenges throughout the course of its journey. The book was published in 2008 by Pan Macmillan and is available in paperback. Key Features: This book was originally published in 2006, and an updated version was published in 2008. The book has been published in more than two dozen languages. David A. Vise is a Pulitzer-Prize winning reporter for The Washington Post. He has written several books including New York Times Bestseller The Bureau and The Mole: The Unmasking of Robert Philip Hanssen, The Most Dangerous Double Agent in FBI History. He has also received the Gerald Loeb Award for Distinguished Business and Financial Journalism.